Robin Bo Carl Soderling was born on the 14th of August 1984. He is a professional tennis player from Sweden. 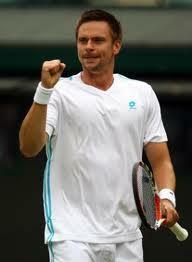 Robin Soderling current rank is world number 5 in the ATP rankings. He reached the successive French Open Finals in 2009 and 2010. In both the tournaments he defeated the number 1 Rafael Nadal. He even defeated Roger Federar, breaking his record of 23 consecutive Grand Slam Semifinals. He also bagged the Masters 1000 event and the 2010 Paris Masters. Soderling started playing Tennis at the age of five. He first entered international tennis in November 1998 in Luxembourg. At the age of 14 he played his first official junior tournament losing the opening match itself. Yet in his full first year in the junior tour (2000), he achieved four tournament victories and in 2001 attained three more titles in the juniors including the Orange Bowl. In the end of that year itself Soderling achieved fourth place and played his first ATP tournament in Stockholm, winning it. In 2002, he tried to break into the men's circuit by playing five more ATP tournaments and the second round of US Open. In a challenger tournament he played in the US Open Junior tournament where he reached the final. In 2003 he played and reached the third level of Wimbledon and reached an ATP Final it Stockholm, earing the year end ranking of 86. Robin Soderling first ATP title came in 2004 and by the year's end he climbed upto world's Top 50. In 2005 he suffered from a serious injury which resulted in a knee operation. Still he managed to win another title at Milan. When he returned in 2006, he bounced back from the 100th place to the top 50s in just three months, even though his knee and shoulder injuries stopped him from playing at his best. He finished that year at World number 25 in the ATP rankings. In 2007 he made it to round 32 of Wimbledon where he lost and this was the first in five years that he did not make it to the ATP Finals. At the 2008 World Team Cup, he was undefeated in four singles and four doubles matches making a record and thus leading the Swedish team to victory. But after disappointing results in both the Beijing Olympics and the Us Open Rodin Soderling changed coach from Peter Carlsson to Magnus Norman. In 2009 with his new coach for the first time he reached the fourth round of a Grand Slam. He also made his debut at the 2009 Brisbane International. Year 2010 was Robin Soderling most successful year in his entire career. This was the first time that he moved into world's Number Four and finished the year at five. At the 2011 Wimbledon, Robin played beautifully but then at last lost to Bernard Tomic because of a bad stomach. He has a record of being the only player to defeat Rafael Nadal in the French Open and to stop Roger Federar from coming to the semifinals of the Grand Slam the first time in 23 matches. Rafael Nadal is a Spanish professional tennis player and a former World No. 1. As of 4 July 2011 (2011 -07-04).Currently ranking as the worlds Number 2.He is is a magnificent tennis player.You want to know more about Rafael Nadal Parera Tennis career, biography and profile then read the full article.